Brief Physical Description: A tiny (3' 3") child with round, pink cheeks and poofy platinum blonde hair. Wears an intricate blue dress with a rose design on the hem and gold embellishments. Has a hairpiece with three "feeler-like" decorations. Never without her favorite stuffed bear, and 5 maids always in tow. Brief Personality Description: A very spirited, if sheltered young girl from a noble family. She adores Sir Carbuncle, a family heirloom, given to her by her father. She considers Sir Carbuncle a hero and aspires to be just as honorable and just, and will excitedly talk about his noble deeds to whoever cares to listen. She has not seen much of the world outside her estate, but she believes people should not be judged unfairly or looked down on upon because of their social standing or where they are from (because that is Sir Carbuncle's code of honor). Her maids care about her deeply and are very dear to her. Has a very childlike concept of life and death, and believes the dead are just people who are going to be asleep for a really, really long time. - Is a witness and key character in a case Ryuunosuke and friends have to solve. What is initially just another burglary attempt at the Berncot Estate (a pretty much monthly occurrence) leads to something larger. He must solve a mysterious murder involving a missing jewel and a vast inheritance at stake. - Juror No. 2 was formerly a maid at the Berncot Estate. Bijou and her maids seem to act strange with Juror No. 2 around, could she and her current employer somehow be connected....? The child of a British nobleman and French noblewoman, Bijou was born into an incredibly rich family. She grew up quite lonely, with Sir Carbuncle and her maids being her only friends. One day as she is roaming her humongous estate with Sir Carbuncle, she finds a dead man in her father's study (or in her words, asleep, causing much confusion with her testimony later in court). As she calls for her maids to help wake him up, she notices another shadowy figure exit through the other door of the study. 3 days before the incidents at the estate occurred, her father, who handled a jewel trade business, had passed away under mysterious circumstances. Her mother had been travelling in France at the time and it would take her time to return to Great Britain, so Bijou had been under the total care of her maids since then. The murdered man turns out to be looking for the Peacock, an extremely precious and infamous blue gemstone that went missing when it was reportedly smuggled from India to Britain illegally. Unbeknownst to Bijou, the jewel is inside Sir Carbuncle and the shadowy figure she saw that day, no regular man. - Bijou is French for "Jewel". - Berncot is a reference to Dr. Barnicot, a character in the Sherlock Holmes story "The Adventure of the Six Napoleons". 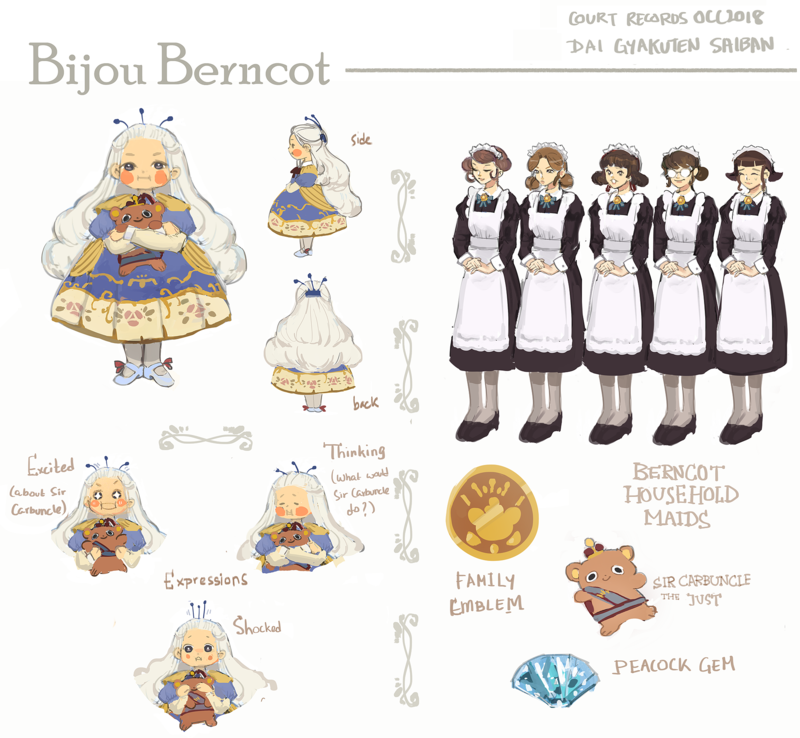 In addition, Bijou had 6 maids in the past. - "Sir Carbuncle" is a reference to the Sherlock Holmes story "The Adventure of the Blue Carbuncle", while it's appearance is based off of the Blue Badger. - Though it isn't pictured, Bijou stands on a footstool placed on the stand since she's so small. - Her maids are specially trained to stop any intruders. They are on par with the Royal Guard. - The concept of the gemstone, Bijou's headpiece, and her maids standing behind her in the formations above were all based off of the appearance of a Peacock.